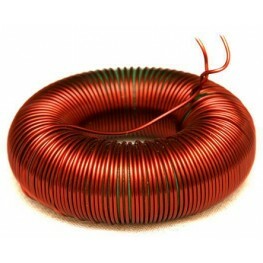 Jantzen C-Coils are Toroidal cored inductors of extremely high power rating and extremely low DCR. The C-Coil is wound around a toroidal sandwich core. It has extremely low resistance and can shift a large amount of power without getting over heated. The core is formed like a donut with a round cross section and is wound from one long piece of laminated steel tape. If the stated maximum power is not exceeded the core will never saturate. In his book 'High Performance Loudspeakers', Martin Colloms praises the virtues of Toroids including low distortion and self screening of stray magnetic fields. Note - The inductance value needs to be measured at 100Hz - The range where they are typically used as an inductor for the bass driver. Typical handheld LCR meters measure at 1,000 Hz and will read a lower value than labelled. This is not a fault of the inductor. Sorted by value then gauge. C-Coil 2.0mH 14AWG 0.06 ΩPower handling of 1500w/8Ω84mm Dia 26mm High ..
C-Coil 2.2mH 14AWG 0.06 ΩPower handling of 1500w/8Ω83mm Dia 26mm High ..
C-Coil 2.5mH 14AWG 0.07 ΩPower handling of 1500w/8Ω83mm Dia 28mm High ..
C-Coil 2.7mH 14AWG 0.07 ΩPower handling of 1500w/8Ω83mm Dia 28mm High ..
C-Coil 3.0mH 14AWG 0.07 ΩPower handling of 1500w/8Ω83mm Dia 28mm High ..
C-Coil 3.3mH 14AWG 0.07 ΩPower handling of 1500w/8Ω84mm Dia 28mm High ..
C-Coil 3.5mH 14AWG 0.08 ΩPower handling of 1500w/8Ω84mm Dia 28mm High ..
C-Coil 3.9mH 14AWG 0.08 ΩPower handling of 1500w/8Ω84mm Dia 30mm High ..
C-Coil 4.2mH 14AWG 0.07 ΩPower handling of 1500w/8Ω93mm Dia 30mm High ..
C-Coil 4.5mH 14AWG 0.07 ΩPower handling of 1500w/8Ω93mm Dia 30mm High ..
C-Coil 4.7mH 14AWG 0.07 ΩPower handling of 1500w/8Ω93mm Dia 30mm High ..
C-Coil 5.2mH 14AWG 0.08 ΩPower handling of 1500w/8Ω93mm Dia 32mm High ..
C-Coil 5.6mH 14AWG 0.08 ΩPower handling of 1500w/8Ω93mm Dia 32mm High ..
C-Coil 6.2mH 14AWG 0.09 ΩPower handling of 1500w/8Ω93mm Dia 32mm High ..
C-Coil 6.8mH 14AWG 0.1 ΩPower handling of 1500w/8Ω93mm Dia 32mm High ..
C-Coil 8.2mH 14AWG 0.11 ΩPower handling of 1500w/8Ω93mm Dia 32mm High ..
C-Coil 10mH 14AWG 0.11 ΩPower handling of 1500w/8Ω93mm Dia 32mm High ..
C-Coil 12mH 14AWG 0.11 ΩPower handling of 1500w/8Ω94mm Dia 32mm High ..